72 in. Width. 168 hp. 32 in. Tires. 25 in. Usable Travel. When the terrain is unrelenting and landscape unknown, there’s no room for pretenders. This is undeniably the nastiest RZR ever. THE DRIVING FORCE IN OFF-ROAD: There are no shortcuts to victory, and we never settle for second best. 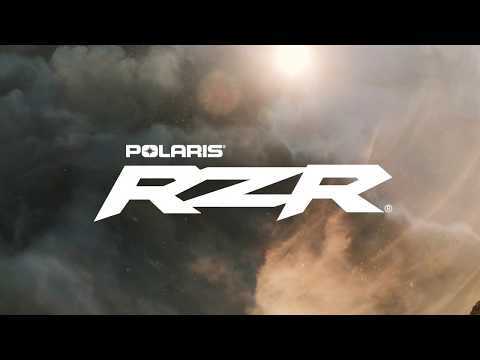 The all-new RZR XP 4 Turbo S defies reason with a breakthrough design delivering a menacing combination of performance and industry leading capability. WORLD-PROOF: The new RZR XP 4 Turbo S has been completely reengineered to be stronger and tougher in every respect. The vehicle's bold dimensions and massive stance have been integrated into a more stable design that delivers ruthless performance that can't be stopped. MONSTROUS 32” TIRES: For the first time ever... 32" tires straight from the factory on 15" aluminum wheels. Custom designed for more grip, control, and 8-ply rated for 249% more resistant to punctures than Maxxis® Bighorn 2.0s. We even turned up the EPS assist to point that rubber with effortless touch. TOWERING 16” CLEARANCE: Nothing else measures up. The RZR XP 4 Turbo S Touts an unstoppable 16" of towering ground clearance, and even though we've pushed to new clearance heights we maintained the wickedly low center-of-gravity... Equal to current XP 4 Turbo. MORE BEEF EVERYWHERE: Anybody can slap a set of 32" on their buggy, but ours are mated to a completely redesigned system designed to handle the added force. Featuring stronger axles and high-clearance control arms, 3-times stronger drive system, reinforced chassis, and more robust drivetrain with improved cooling. RUTHLESS RAMPAGE: So smooth it defines the laws of gravity. So smart it practically rewrites them. 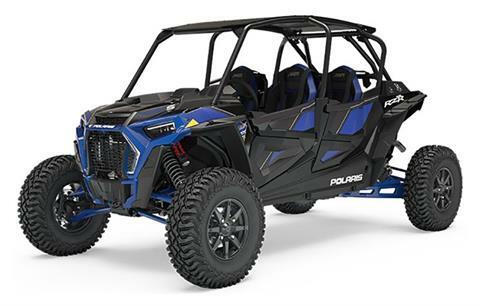 The RZR XP 4 Turbo S combines the most useable suspension travel in the industry with the most useable suspension system for active, on-the-fly terrain obliteration. 25” TRAVEL: RZR XP 4 Turbo S gives you an industry Leading 25" of travel, the kind that you can actually use in a driving event before bottoming out on the skid plate. FOX® 3.0 IBP LIVE VALVE SHOCKS: Internal Bypass FOX® Shocks feature enhanced calibration for the DYNAMIX Active Suspension system to optimize every single inch of the massive suspension travel for both low-speed comfort and high-speed performance, on-the-fly. DYNAMIX ACTIVE SUSPENSION: DYNAMIX was designed so you no longer have to choose between setting your suspension for a comfortable ride or for performance. Now you get the best of both every time you ride because DYNAMIX adjusts automatically as you're driving. ALL NEW DESIGN: Inside the dark heart of the beast, the entire cockpit has been reengineered - instinctive in nature, intuitive in control, and purposeful in detail. Beyond these comfortable confine, predatory looks. Blacked-out-highlights painted hues, and menacing LED lighting reveals the vehicle's true primal purpose. DRIVING POSITION: A new driving position is mated to a sculpted hood design resulting in uncompromised sight lines and race-inspired, yet comfortable ergonomics. Plus, 4-point harnesses and new premium Flat-Bottom Sparco® steering wheel now come straight from the factory. RACE-INSPIRED COCKPIT: The bold new sculpted dash houses a revised gauge package that offers greater diagnostic detail when navigating rugged terrain at speed. Standard 7-inch Ride-Command® Screen and enhanced storage solutions bolsters connectivity and capability. PRIMAL ILLUMINATION: Visually assaulting LED lighting not only helps to define the menacing stature of the new RZR XP 4 Turbo S, it also greatly enhances visibility. The new LED lighting package includes blacked-out LED headlights, signature LED running lights, and high-visibility LED taillights. 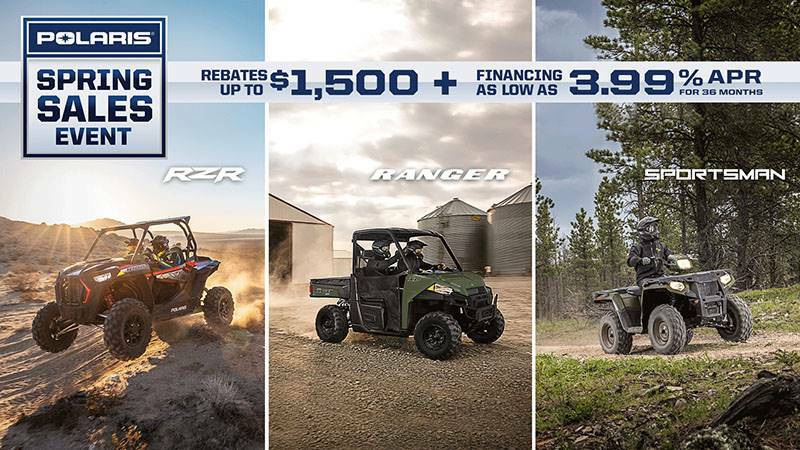 TURBOCHARGED FURY: From the moment you stomp the accelerator, the world's most powerful RZR comes alive with a chaotic fusion of raw power and mind-numbing acceleration. Speed is electrified with aggressive throttle mapping and a forced charge of induction creating an enviable combination of horsepower and our signature low-end torque others can only follow. APEX HUNTER: By combining a flick-able wheelbase with the stabilizing inertia of massive tires, RZR XP 4 Turbo S was engineered to combine ground-bending performance without compromising agility and precision. Meanwhile, other competitors keep falling short when it comes to off-road agility. Click on the video to learn more. RIDE COMMAND®: Connect beyond the terrain of the off-road experience with revolutionary Ride Command technology. Communicate, navigate, connect, track, and visualize every moment with brilliant 7" glove- touch screen clarity. INCLUDES: RIDE COMMAND® 7 in. Glove-Touch Display: DYNAMIX Visualizer, Digital Instrumentation, Built-In GPS, Topographic Mapping, Bluetooth & USB Smartphone Connectivity, AM/FM & Weather Radio, In-Vehicle Communications Capable With Optional Sena Headsets, Speedometer, Odometer, Tripmeter, Tachometer, Coolant Temperature, Volt Meter, Hour Meter, Service Indicator, Clock, Gear Indicator, Fuel Gauge, Hi-Temp Light, Seatbelt Reminder Light, Fault Code Display, DC Outlet. Cast aluminum - 15 in.